Is This the Best Way For a Celebrity to Announce a Divorce Or What? Guy Pearce, the British-Australian actor known primarily for dressing in drag in the desert and learning about himself through body art, announced his divorce from Kate Mestitz this week in an oddly kind and direct series of tweets. The couple had been married since 1997. If I gave celebrity breakup announcement grades (perhaps that’s something I should start doing), I’d give Guy an A+. For comparison’s sake, I’d give Chris and Gwyneth’s letter about “conscious uncoupling” an F, Ben and Jen’s more traditional announcement a B-, and Jack Berger’s Post-it a C+. 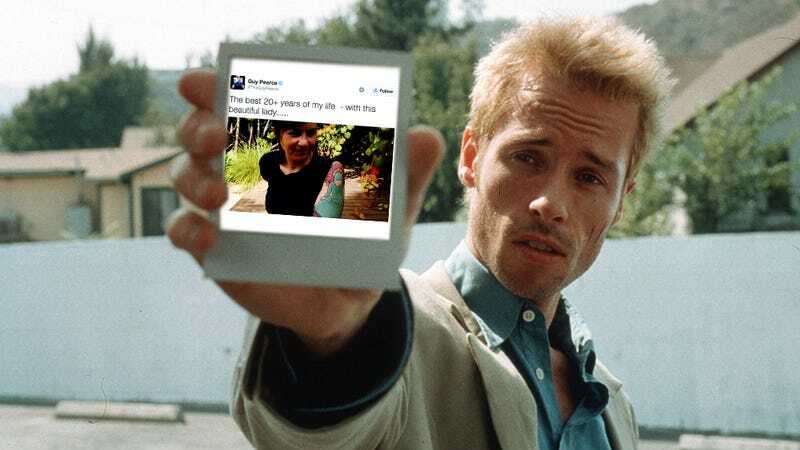 I don’t think about Guy Pearce often, but from now on, when I do, I’ll remember this and whisper to no one in particular, “Those were good tweets. Yep, those were good tweets.” Then I won’t think about Guy Pearce again for a while. Image via Newmarket Films / screengrab.